Yaeger CPA Review has over 40 years of history and prides itself on a whiteboard teaching approach, innovative student portal, and flexible pricing. So, let’s see if the latest Yaeger CPA Review 2019 suits your budget and learning style. 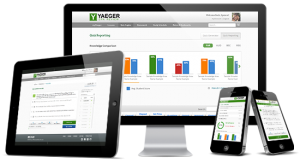 Get Instant 20% Off with Our Exclusive Yaeger CPA Coupon Codes! Dr. Phil Yaeger, CPA, launched his CPA review course in 1977 with 13 students in Washington DC. Later, he established himself as the largest CPA review course provider in the DC metropolitan area. Since the computerization of CPA Exam in 2004, Yaeger CPA Review has been providing its online course to candidates around the world. Despite an ambitious expansion plan, Yaeger CPA Review remains a family business with its unique old-school teaching methods and the unique ability to talk directly to your professor. There are other professors in addition to Dr. Yaeger. However, all of the Yaeger professors utilize the tried-and-true whiteboard teaching format that candidates have come to expect from Yaeger CPA Review. Yaeger is one of the most affordable CPA review courses out there (Yaeger costs approximately 1/3 of Becker CPA). Plus, they also offer financing should you need to stretch the payment of your course out for several months. For cost-conscious candidates who need a complete review course, Yaeger CPA is often the best solution. Yaeger CPA Review is different than other CPA review courses in that it only offers one complete course. Yaeger CPA doesn’t want to offer its candidates with a course that doesn’t include all the features that are necessary to complete the CPA Exam. Therefore, there is only one complete course for you to choose. But don’t worry — you can purchase the course in individual sections or as a bundle that includes all 4 sections. Consequently, you will lose the Yaeger CPA discount if you only purchase one part at a time, so we highly recommend you purchase the 4-part bundle. Yaeger CPA provides financing for candidates who do not wish to purchase their CPA review materials in one lump sum. Also, there is no credit check. Rather, Yaeger CPA simply charges your credit card once a month for 12 months, and at this time, your course will be paid in full. Our team recommends that you only consider financing your course if you really need it. If for some reason your credit card gets lost, stolen, or reaches the maximum limit, your Yaeger payment may be declined. If this is the case, you may lose access to your course. And, even if this only occurs for a few days while you sort out the matter, the loss of any study time at all could mean failing a section or having to reschedule. Therefore, we encourage you to pay for your course in full, if possible. Yaeger is the only affordable CPA course to include a CRAM course. If you’re not familiar with this feature, a CRAM course covers key concepts you will need to know for your exam. Consequently, a CRAM course is great when used as a final review before your exam date or as supplement to a non-Yaeger course. CRAM courses are an integral part of your final review and will help you to identify your strengths and weaknesses. These audio lectures are presented by Yaeger instructors, and you can download them to any device. These MP3 files are great for on-the-go learning so that you never miss an opportunity to reinforce key concepts. Yaeger CPA offers over 2,000 flashcards covering the 4 exam sections. You can review these flashcards from any device. Additionally, you have the ability to flag any flashcards for further review. Similarly, like in the case of the CRAM course, Yaeger is the only affordable review provider to offer flashcards. Finally, the Yaeger CPA test bank also includes many detailed analytical points for your reference, allowing you to pinpoint your weak areas. Why should you pick Yaeger? Let’s take a look at some things that may sway you toward using Yaeger CPA Review. For those who are visual and tactile learners, the whiteboard approach is really helpful. Using this approach, Yaeger instructors go over the concepts and use the whiteboard to help them illustrate important and challenging concepts. We want a teacher — a real person — who talks to us and actually uses a whiteboard to write down the calculation and explain every step. This is the Yaeger’s approach, and you may be surprised to know that this seemingly conventional, down-to-earth way of teaching has become almost extinct. In fact, Yaeger CPA Review and Roger CPA Review are the only two CPA courses to lecture in this profoundly helpful whiteboard style. In a typical CPA review course, the professor may lecture, but he or she is going to be reading from a teleprompter. There also may be times where calculations are shown on the screen, but the professor is usually off-camera at this time and you guessed it — he or she is still reading from a script! With Yaeger CPA Review, Phil and his team of professional instructors go through each AICPA Blueprint and hundreds of multiple-choice questions. Additionally, the instructors are careful to explain why the questions are tricky and what you can do to avoid the tricks. The instructors focus on becoming proficient in the core concepts and every representative task addressed in the AICPA Blueprints. Plus, Yaeger’s course is loaded with many features that no other course under $2,000 offers. Therefore, Yaeger is an excellent value for the money. Live classes are not available in Yaeger CPA Review, which means that access is only available online. However, Yaeger provides a solution by offering a hotline that lets you ask questions by phone. But, if you don’t like asking a question over the phone, you can leave a message in the AdaptaPASS Student Portal, and the instructors will respond to your questions directly. No other review course offers a phone number where you can directly speak to a professor. This is one of the least expensive courses on the market, and you get a lot for the low price. No other review provider has structured their 2019 review course around the AICPA Blueprints. Students are pleased that Yaeger has spent the time to align their methodology with the structure of the CPA exam. 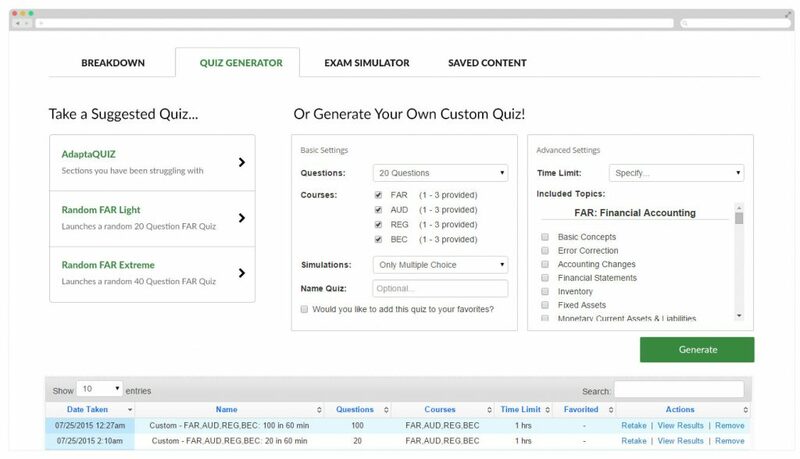 With only a little over 4,000 multiple-choice questions and simulations, Yaeger CPA has one of the smaller test banks. In contrast, 9,000+ questions are included in both Gleim CPA and Wiley CPAexcel. So, CPA candidates who love to learn through answering every single question possible on each topic may feel limited by the size of the Yaeger bank. However, since Yaeger is quite affordable, you may consider purchasing a supplemental test bank. Gleim CPA includes over 9,000 questions in its standalone test bank, making it the largest standalone bank available on the market. Some CPA candidates feel Yaeger is slightly lackluster in terms of its presentation and course format. The production value of the lectures isn’t as high as Wiley CPAexcel; however, the styles are also different. When you select a whiteboard course, you’re going to have to give up some of the production value. This is because there is only so much CPA review courses can do to embellish a whiteboard lecture, so if you need more bells and whistles, you may want to consider a traditional lecture course like Wiley CPAexcel, Gleim, or Becker CPA. Also, along these same lines, the Yaeger lectures aren’t as entertaining as those found in Roger CPA Review. There are times when we want to doze off even though the stuff is important — this happens especially in AUD and REG for many candidates. Finally, Dr. Yaeger is probably the most “old-school” and is generally liked by students, but I have readers who find him “monotone” and repetitive. But, if he helps us pass the exam in one go, this shouldn’t be an issue. Yaeger CPA Exam Review provides free or discounted updates for a limited time. Updates are free within the 18-month access window from the date of purchase. In contrast, review courses such as Gleim offer a money-back guarantee, which Yaeger CPA does not provide. Don’t Forget the Yaeger CPA Discount! That’s right — I have a Yaeger CPA review coupon! So, if you like Yaeger, use the Yaeger discount code below that is exclusively for my readers! What Do I Pass the CPA Exam Readers Think of Yaeger CPA? Learn how my readers feel about Yaeger CPA while reading some of the Yaeger CPA reviews. These reviews of Yaeger CPA should further aid you in determining if this is the best course for you! I think Yaeger CPA review will help me pass because up to this point, nothing else has. Although I am happy with my current review program, I don’t fell like its fully preparing me for the exam. I tried other more expensive programs and did not pass. I am seriously considering just going with Wiley only, books and online MCQ’s because I’ve read such great reviews on them. I’m the type of learner that needs to see things worked out visually and I need to practice as many MCQ’s as possible. Looking through the Yaeger sample lectures along with knowing how great Wiley products are, I am sure that the combination of the two will give me what I need to finally put the CPA exam to rest. Not only do I think Yaeger CPA Review course will help me pass, I KNOW it will! After a 13 year “break” from college I decided to go back to and get my accounting degree so I can obtain my CPA license. During that time I realized one thing; I excel at live courses but really hate self study. Where we live there is a University, but they do not have a CPA review course. We are in a very rural area so that would be the only option. After researching review courses for a year, and having one currently, I haven’t made the leap to take the first exam. Why, because it is all self study? With Yaeger I will have lectures like sitting in a class room, I will also have access to help for areas I get stuck in. I believe my college background did not cover some areas in depth so if I don’t have lectures I will have a LOT of study time working on those areas. With video lectures I can save time and stay motivated. I understand lectures will not take the test for me, but also know this caters to MY learning style. Working full-time, being a Mom, and wife takes a lot out of my day. I do not want a review course that takes away from my family time unnecessarily. If I am going to take the time to study, I want to pass. This course is a perfect match for that scenario. I am an African American first generation college graduate earning my B.S. in 1996 [U.M.E.S. ], M.B.A. in 2002 [Morgan State University], and a Graduate Certificate in Accounting in 2010 from DeVry’s Keller Graduate School of Management. I started studying for the CPA exam during my time at Keller using the Becker format. I went through all four sections and due to life events was unable to sit for the CPA exam. After getting settled with a career relocation, I decided to start back studying with Becker. I was unhappy that after paying the expenses for taking Becker, to retake the course or reuse the software, it was just as expensive as it was when I first enrolled in the course. I felt that if I paid for the course once, I should still have unlimited access to the course CD’s and the content that I purchased. However, this was not the case. I see unlimited access to the Yaeger materials and content as being a major incentive. Having reached my 38th birthday on July 23, 2012, I have now made a conscious decision that I want to start studying for the CPA exam again and not let my dream go. What I think would be most beneficial, for me is the “Old School Approach” to teaching. Having worked through another vender for my CPA prep, I can appreciate having someone go through each MCQ so that I fully understand why the answer chosen is the correct answer. Being a consumer in a world filled with automated systems and not having the opportunity to talk with a live person can be extremely frustrating. I think it is awesome that I will have the ability to talk with a live person, and maybe even the owner, to discuss a question and have him walk me through it!!! I can personally say that I called Yaeger 800 number myself to test this. I got an answer when I called. Although the gentleman was not able to take my call, he said that he would call me back. I was EXTREMELY impressed when I received a prompt call back. Finally, I would like to say that earning my CPA will allow me to enroll in the Ph.D in Taxation program at Washington Institute for Graduate Studies. As I am the first in my family to attend and graduate from college, I will also be the first and only to earn a Ph.D. Just as Mr. Yaeger has done, I want to be able to give back to my community by teaching my passion for accounting and taxation. I want to be a guiding light, a force, and an inspiration for many underprivileged minority college bound youth. I will end with this story. I was a student in undergrad and was told by the dean of my school that if my family and I did not have the funds for me to complete my studies, than maybe I should not be there. Needless to say, I did not let that stop me than, and I don’t want financial reasons to stop me now. Thank you for allowing me to post and submit for the contest. One final thought. I believe that knowing and understanding are completely two different concepts. While memorization does play a role in the learning process, I feel that the Yaeger system of teaching will allow me to apply what I have learned to any sifutation and not just memorize information for testing purposes. So not not only will this allow me to pass the test, but will benefit me for a life time. I’ve taken one of Yaeger’s CRAM courses. I found it thoroughly helpful and it definitely enabled me to pass my exam. The video lectures are user friendly with options to start from the beginning or from where I left of. Yaeger gives clear direction and instruction on what to expect on the exam on a particular subject or topic. Problem areas to focus on and homework problems to spend extra time in. Many times I’ve found myself learning the “back story” of a law or a calculation and that helps tremendously with my understanding. Yaeger is a proven method of study that will produce successful results! I think that Yaeger’s CPA review program would help me to pass the exam because it would help me have a more in depth understanding of why something is done a certain way. I think having an instructor go into detail about the method of solving problems would help to reinforce concepts that I have not studied for awhile. I have been out of college for many years, so the concepts that are covered on the CPA exam are not as familiar to me as they may be to someone fresh out of school. I could definitely use a refresher course on many of the topics. I still have the desire to earn my CPA, but I think that I need a fresh approach to studying for it. I would really like to have the opportunity to try something new and I have read many great things about Yaeger. It would be great to have the chance to utilize their course. Why will Yaegar CPA review help me pass? Simply put, because it couldn’t hurt! I earned my Accounting degree nearly sixteen years ago and I am currently working full time, I have two children and a husband at home to take care of, and I am using a different CPA review course to study at home every night. I have been studying and taking exams for the past year and a half, but still do not have that license in my hand. Listening to someone read directly from a text book and telling me what to highlite and what notes to write down has not been the success story that I had hoped for. My hope is that the Yaeger review will help me to understand the concepts and give me that exta push I need to pass the exam! Watching someone actually work through the concepts and being able to visually see things will be a huge help in understanding and remembering the detailed concepts! I’m sure I speak for many people out there taking this exam….I’m tired of studying! I’m tired of giving up my personal time! I’m tired of feeling like a failure every time I don’t see a 75!! I just want a program that will work for me! I am determined to pass this exam and get back to normal life!!! I went after my MPA 12 years after graduating with my BS. The MPA was just a stepping stone towards the CPA exam. When looking at all the CPA study materials, I was overwhelmed by the choices. I knew that reading and memorization were not the study method for me. To me understanding the concepts was more important so I wanted CPA study material that would show me the “whys” behind the theory. I’m currently using Yaeger to study for the FAR section. I love being able to stop and rewind a class over a part I may have trouble understanding. I like how the instructors use the white board to explain concepts with T-accounts and journal entries instead of just telling which parts to highlight in the book. I like using the forum for help on a question or for support and encouragement. I also like the fact that the instructors are readily available through email or phone for any questions you may have. For someone who has been out of school for awhile and needs a refresher, Yaeger’s approach to studying is perfect. I have been on your site and read all of your thoughts on a CPA exam review that can help me pass the exam, and I picked the Yaegar CPA Review way before this giveaway was announced and decided that this would be perfect for me. I’m not just say this because you’re doing a free giveaway; I’m saying this because I need that old school approach of being taught by using chalk and a blackboard. I need a great explanation of the concepts and how to work the problems, because me teaching myself is not an option of mines. I just hope that I’m picked for the giveaway and thanks in advance. I want to win the Yeager CPA Exam Review for me to finally become a CPA! It is time for me to get a decent review that will help me prepare well for the exam, and I am hoping Yeager will THE ONE. Hope to hear a great news on the 20th of August! The Yaeger CPA review seems to be the best bet for me and my style of learning. Personally, I have tried learning some courses (SQL and Access) in the self-study formats and have unfortunately fallen flat on my face. I realized that I definitely need an actual person teaching the course. For some reason, that interaction and layman’s explanation that occurs through the normal course of communication is greatly needed. Yaeger’s “old school approach” is right up my alley. I’m 35 and a single father of 2. I graduated in 2000 with an undergrad double major in finance and accounting with a 3.2 GPA, but have yet to land that role that will really help me provide for my children as I would like. In all honesty, I have been earning the same income since 2004. It is time for a change. I was initially afraid of attaining my CPA due to thinking I would be pigeonholed, but as I grew wiser, I realized the amount of doors that would open as a result. Even after viewing some of the samples here as well as on youtube.com, I feel very confident about passing and the best part is knowing I wouldn’t be going at it alone. I believe this review course will allow me the leeway I need to expand my career outlook and provide more for my children. It’s also my desire to teach the young men in my church about finances and accounting and how it can greatly affect their lives. With my current level of income, winning this course would be the only way I would be able to reach my CPA goal. With the two full courses Yaeger offers as well as a single course for each section, as well as a CRAM session, and real-live help – all geared toward my ultimate success – I don’t see how I can fail! I have been out of school for almost a decade, and I believe that the “old school” method Yaeger provides is exactly what I need to be able to successfully pass the CPA exam. Although it isn’t a traditional live course, I like the customer service you are able to receive by phone. No email tag that can make one question take a week to get the answer you need. I also like the CRAM course they provide at the end to give you that extra push to the finish line. I truly believe that with Yaeger I will be able to pass all parts the next time I sit for the exam. I highly recommend Yaeger to anyone who is trying to choose between the different review courses. Yaeger is a great value and will help you pass the exam. I have had some questions along the way and the customer service they give is tremendous. When Phil Yaeger calls and leaves you a voice mail, it makes you feel good about your purchase, to say the least! After 8 years in banking, I was ready for a change. I was not an accounting major so I went back and took extra college classes and started at a public accounting firm in December. I started studying for the exam after my first tax season. I took and passed BEC on the first try with the help of Yaeger. I’m finishing up studying for REG now and anticipate passing it as well. The videos are great! I also recommend investing in the CRAM courses they offer. If you choose Yaeger for your review course, you won’t regret it! The instructors review lots of examples. I have done a lot–and I mean a lot–of research for a cpa review course that won’t break the bank. Although Yaeger isn’t the cheapest out there, it seems to be the best for helping students to grasp the concepts by having video lectures and a hotline. In the meantime, I will continue to save my money to be able to purchase the right review course once I find it. I would recommend Yeager because it is affordable by everybody. In addition to that, Yeager uses the very detailed books from Wiley review course. People can even buy Wiley’s books from Amazon, which is again cheaper from other book stores like Barnes & Noble. You don’t have to buy the whole course again for the newer version you only buy the new books for $35/ea and get the updates. Yeager videos don’t have any expiration, which you can use any time you want, and can go back and forth quickly topic by topic. I am recommending Yeager of being a CPA candidate and unlike lot other candidates I was able to spend money on most of well recommended course and ended up using Yeager to have better understanding on the complicated concepts to achieve my goal CPA Certification. Best of luck to all CPA candidates. I have feared the CPA exam for many years, due to my biggest fear of failure. People always looked at me to succeed in everything. Being the 1st to go and graduate from college put a lot of stress on me throughout the years. My next biggest challenge was becoming a CPA. As I watched many of my friends not pass or took years and years to pass the exam, I found ways to discount myself. After completing my MBA, I began to get a little bored and no matter how I tried to forget. I could not erase the CPA exam out of my head; somehow it always found its way back to taunt me. I really had to sit down and figure out if I would be doing the exam for me or for others. The more I aligned my career and personal goals, I knew taking and passing the exam is what I wanted. I enrolled back in school to become eligible to sit for the exam after I stumble upon Yaeger cpa review from I pass the CPA blog. I thought to myself this is nothing but confirmation that I can pass this exam. The learning techniques are exactly what I need. I am what you would call a visual learner. I always seemed to excel in the classroom but not with standardize test. After watching some of the Youtube demos and grasping the concepts with ease, I truly believe that Yaeger is for me. I think Yaegar CPA review will help me pass the cpa exam after taking CPAExcel and Becker, I need to go back to how I learned in college…old school from 1995-1999. Yaegar teaches in the way my college professors taught me accounting. CPAExcel did not explain what I needed to know, just went over everything…well that would mean memorizing and studying huge textbooks. Becker was overpriced and not to my way of thinking. Yaegar is to the way my brain works and I can see myself not quitting on this program and finally passing my cpa exam!!! I’ve heard nothing but great things about the Yaeger course. I’m taking my first section (FAR) in about two weeks, but of course I have many miles to go before I’m done! What stands out to me is the old school, write-it-out style of the Yaeger course. One of the biggest challenges I’ve been facing with my current review materials is not being able to see how it is done. Sometimes just having the answer in front of you, even with an explanation, is not enough – you need to see it worked out, step-by-step. Thanks so much for this wonderful opportunity! I’ve been trying to pass the cpa for almost 10 years now. I need help. Thanks !! Yaeger CPA Review course will help me pass because it was made for me and students like me. I have used other review courses in the past and have been unsuccessful in passing the CPA exam. This is because I find it excruciatingly painful to sit in the same spot for hours looking at a person sitting in the same spot or unable to see another human being at all. I need someone I can see and connect with as they teach me. I want to be able to see someone writing on the board which allows me to follow what they are saying and take notes as I go. The connection and personal feeling that Yaeger offers adds an element to studying that makes it interesting if not fun. Being able to see the instructor as you laugh with them at a corny accounting joke makes the lecture that much more enjoyable. Yaeger can make studying for the CPA Exam something that I want to do instead of something that I have to do. I believe I can easily sum up the reasons as to why the Yaeger CPA Review program will help me pass the dreaded CPA exam. As a former user of a competitor’s review program, I passed BEC, failed Audit and Reg, and didn’t even attempt FAR due to the lack of confidence. This particular review program just had me highlighting line after line after line in the study book and making notations and mnemonics in the margins. All the while one of the instructors just kept repeating about how much money I’d make once I passed the exam. The Yaeger review isn’t like that. I have actually recommended the program to some friends who have used it AND passed. The reason why is simple. Yaeger teaches you the material. Phil, Cindy, and Gary explain the “how” and “why” – not just providing you with mnemonics. They help you understand it and show you how to work through the problems. It’s like being in college again. While some people may be able to get by with memorizing and highlighting a book, actually learning the principles/concepts and having the ability to understand the material will help me during the exam to confidently read those exam questions; select the best test answer and pass. With Yaeger’s CPA review program, I will defeat this exam! I like the Yaeger course because i believe it will help me to not only pass but throughly understand the course as they explain the concepts in detail. and also I like the old school method. In fact even now while preparing for the exam i do write it down on my white board so that i have throughly understood the concepts. Hence this method is something i am very comfortable with. I just heard the sample FAR simulation and was throughly impressed. Thats one area i am struggling with and the ease with which it is explained was just soo simple and easy to understand. Hence i am looking forward for this course! The Yaeger CPA exam review appears to be a program that will help me pass the CPA exam. I have tried other review courses including trying just the Wiley CPA textbooks alone. Have I passed a section yet, no but I am hopeful. Expecially after viewing what Yaeger brings to the table. I think the old school teaching approach, coupled with the Wiley CPA text(which is awesome just has a good deal of information to digest), and the learning tips could be the answer to three letters CPA! I have viewed Yaeger materials via friends who have purchased the program. The best way to explain my thoughts of Yaeger CPA Review is that it is a diamond in the rough. The lectures are detailed and indepth. They hold true to their goal to teach the information to the student so they can identify the theories behind the material as opposed to simply trying to get one to memorize information. I personally am a learn by lecture student and the methodical/old school approach will help me retain the information on a higher level. I can also say that I am the type of person who asked my teachers a lot of questions. What better way to receive feedback or clarification than to be able to call an instructor and have them explain their lesson to you?!? From my limited experience and the success stories I have read, I know I can be a Yaeger graduate with their help! I believe that the Yaeger Review course would allow me to study at my own pace and give me the support I will need in order to pass the exam. Yeager CPA review is the most appropriate review course to assist me in my pursuit of this professional course. My method of study needs an ignition of interest in the subjects that I am pursuing. This is best accomplished with a teacher who can inspire me to appreciate the depth and beauty of the subject itself. I think the old school teaching methodologies that Yeager incorporates coupled with the teachers expertise provide me exactly that. To get through any professional examination, one needs to acquire the cutting edge and the extra skill needed for a particular subject. This requirement is met with Yeager which provides all the tricks to pass the examination. 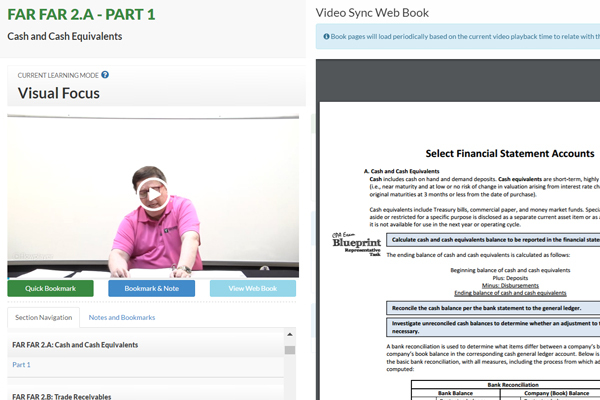 In live classes, the focus and concentration sometimes tends to divert which is why I prefer Yeager styled homestudy kit to review the material anytime. The hotline is helpful to get clarity of the concepts. Lastly, since I have passed out of college long back, I need to get in touch with a real classroom environment to instill in me the willpower to get back to where I left my pursuit of being a professional which Yeager best provides. ….I have made the choice of being a stay at home mom for the sake of my children. This means that the financial constraints that I am subjected to, give me the wisdom to chose a review course that is cost effective. At the same time it should have the quality to get me through the CPA exam. Yeager review course is cost effective and of good quality. I believe Yaeger CPA Review can help anyone pass the CPA Exam! I have taken the CPA Exam twice with other review courses to no avail (Becker). I was so disappointed and discouraged. This time around I am doing a thorough research of review courses. On Yaeger’s Facebook page and website there are so many successful testimonials and posts about people not only passing but passing with scores well above the minimum the FIRST time! Additionally, there are student blogs to follow to let you know their struggles and successes with preparing for the exam. Personally, I am impressed with the “old-school style of learning”. I retain information better that way. I feel like Yaeger is very confident in their product and how they present the information to CPA candidates. I appreciate their homestudy program that offers the “in-class” session. I also, like the fact that they provide updates on exam content and new rules in the industry on YouTube! Pretty awesome. Of all the CPA Review Courses I have researched I am most impressed by Yaegar and believe I will finally pass the exam with their program. I have been studying for CPA for over a year now and can’t get my self ready to take the exam (fear of failure I guess). Mostly I have used reading material and flash cards. I have seen the YouTube demos and I am very comfortable with this old school approach. I am on the hunt for CPA. I have prepared the spear and hoping Yeager will be the spear-head. I am 47 years old and have dreamed of becoming a cpa since Highschool. Yes, 28 years have passed. I returned to college and got the necessary education (Master of Accouning) to qualify to sit for the exam. Now I am ready for review. After reading the cpa review course review on Ipassthecpaexam site, my mind was made up to purchase Yaeger CPA review. Until I received an email about all the great gadgets I would receive if I used another course. I purchased the bite sized lessons,videos,and course materials, unfortunately the course is rather mechanical and out of my learning style, with nuggets too small to utilize….boy am I disappointed. I have cancelled FAR and am scratching and clawing to be ready for REG at the end of August. I believe yaeger can help me pass with the old school approach that got my attention initially, the unlimited access, and the variety of other study options, like, wiley, audio and cram. Especially audio because I travel a lot and need the flexiblility. I believe Yaeger’s review course will help me master the concepts, focus on the test materials, and get back to a familiar learning approach that include applying the accounting concepts. Well, I have spent the money, but if I had to do it over again it would definitely be Yaeager. Maybe this is my chance to do it over again. My window(and test window) is closing and I believe Yaeger is the course to help me review and pass the exam without wasting anymore time, money or losing courage. This is my first round and I will pass. I am married with two kids, work full time, and take online classes for my MBA. I have become thoroughly acquainted with studying on my own through taking most of my undergraduate and all of my graduate courses online. I felt the CPA Exam should be similar and I should be able to study on my own and pass the first time around. I bought the Wiley books and found a study schedule from the Becker review course and started towards my goal of having all four sections of the exam passed by the end of November 2012. I have just completed my first week of 36 hours of studying, probably more if you add in the miscellaneous times of studying flash cards, and I feel there is something missing. The key to me passing the exam is out there and I don’t have it yet. That is when I decided to search online for supplemental materials or anything that would give me the confidence I need to know that in four months I will pass all four sections and all of this sacrificing will be worth it. I found Yaeger CPA Review and watched the sample videos and I knew this is it! As I was watching the FAR section sample video I was excited to hear the simulation explained in a way that I could thoroughly understand it! I enjoyed the fact that I felt like I was in class again watching the instruction explain the problem on the board, discussing information from previous problems and text that would help answer the current problem, and explaining every detail clearly on how to solve the problem. After watching, I sat back and felt extremely confident that I understood the problem, what it was asking, and how to solve it. There is also customer service available and unlimited viewing which is a great component and is rare to find! I know if I use this review program I will surely reach my goal and pass the exam! I have four months! This is highly ambitious and some say impossible, but I know that through determination, the right materials, and utilizing every spare moment I have to study, I will reach my goal. The Yaeger CPA Review is the key for me and will ensure that these next four months are spent wisely and PASSING the CPA Exam! I have been in accounting since graduating from college. I have studied for the CPA exam and applied for a Notice to Sit twice. I have failed twice with two different programs. I have used both the Becker and CPAexcel programs. My learning style is by putting the information I am studying into my own words. This seems to work but it does not work when I study for the CPA exam. I like computer based studying at your own pace. This is very helpful while working full time. Failing twice on all parts of the CPA exam is very frustrating. With the Yaeger CPA review if I pass all four parts I would make sure everyone knew that this course is the one to take from the beginning. Opportunity, that’s what studying with Yaeger will get me! I’ve just recently graduated from college this past May and have been finding trouble gaining employment in the accounting industry. Being a year-round student-athlete limited my ability to gain internships (a big indicator of what employers are looking for in new hires). With Yaeger’s approach of explaining and working out problems, not just telling, I feel it would be the best way to help me study for the exam and ultimately become a CPA. I’m the kind of the person where you explain it, I work at it, and I learn it. I like Yaeger teaching method, they are very detailed and they go over the multiple choice questions explaining all details. I’ve used FAR; unfortunately I did not pass it yet (I failed by one point 74). I just tried second time and waiting for my score. Wiley test bank and Yaeger need to pay more attention to simulations, because simulations in the actual exam are much harder and much longer than in the test bank, that’s were I have problems. I’m also using Roger for AUD and this is more entertaining bur also very good. Yaeger pays much more attention to MCQ and they are very detailed. I love Cindy she is a very good teacher ( You can be very smart but not be able to teach). I will good luck to each and every one of you and myself also. It is not an easy journey, it’s extremely stressful. Yaeger CPA Review is one of the most affordable and effective courses out there. Yaeger teaches the material at an understandable pace, as if you are learning everything for the first time. They have amazing customer service and can directly get in touch with the instructors if you have any questions. The best perk is that you will have access to the lectures for as long as you need in order to pass! Yaeger’s course would be the perfect course for my learning style because the instructors go through individual problems in-depth. The course comes along with the Wiley book which allows you to practice until you understand all the accounting methodologies. I am a graduate student in an accelerated Masters of Accounting program and plan to sit for the CPA exam upon graduation. Since I did not get my undergraduate degree in Accounting, a review course such as Yaeger’s would help me tremendously in preparing for the rigorous exam. I am confident, with Yaeger’s 88% pass rate, that if Dr. Yaeger can’t help me pass, no one can! With the combination of Dr. Yaeger’s step-by-step approach to teaching and the acclaimed Wiley CPA review books, the team at Yaeger CPA Review has put together a comprehensive program that provides candidates with the tools necessary to not only pass the CPA exam, but completely understand the accounting concepts required to excel in the accounting profession. After reading the review that Stephanie has put together, and watching the sample videos on the Yaeger CPA review website, I am certain that Yaeger is the right CPA review program for me. I am not a student who is able to simply listen to an audiobook and immediately retain all of the information. In order to be successful on the CPA exam, I need to thoroughly understand the concepts covered on the exam. It is for this reason that I am confident the Yaeger CPA review is right for me. Yaeger is the only program that assumes a “teaching” approach as opposed to a “review” approach to the CPA exam. Furthermore, the fact that they are using Wiley’s CPA review books instead of publishing their own review books (and potentially making more money), really proves that the Yaeger CPA review team is truly dedicated to providing their students with the best possible opportunity to pass the CPA exam. I want to work with a CPA review company that is genuinely interested in my success and the success of all of its students. There are many programs available to aspiring CPA candidates these days, however, after looking into all of the rival programs, I have become a strong believer of Dr. Yaeger’s approach to teaching the CPA review concepts. I hope to join the Yaeger CPA Review team and become a contributing member to the impeccable 88% pass rate! Thanks for all the information on CPA Exam Review courses. If I was chosen to receive one of the review courses I believe the old-school style would be most helpful to me in my preparation. That an the cost savings as well, since money is an issue. My name is Tammy. I am the first generation (born in Vietnam) in my family to decide on taking the CPA exam. I believe passing the CPA exam will enhance my career as an accountant and provide financial stability to my family. Beginning 2014, the CPA’s education requirement from California will change, so at this point, I must pass the CPA exam. Stephanie, I have been lurking to your website since the day I decided to go back to school to meet the CPA’s education requirement. I have read your comparison on CPA reviews courses, and I believe Yaegar is the best choice for me. Dr. Yaegar does his lectures on white board which is best suited for my learning style, because I can retain more information in traditional learning format than PowerPoint slides. I need a teacher who can show and explain to me step-by-step how to solve a problem like Ms. Simpson. Dr. Yaegar also uses the Wiley’s CPA review courses, which is a great supplement for this review courses. With Dr. Yaegar to guide me through my learning and Wiley review books as my supplement, I am confident that I can pass the CPA exam within next year. Hello I’m an Asian currently located in the Kingdom of Bahrain. When I first heard that US CPA is being offered here, i really would like to take the shot. I started researching for an affordable and best online review that would help me pass the exam. So far, i found YAEGER the best among of all the online review. Since i have graduated 4 years back I would like to have a fresh start , something that will walk me through again step by step with all my accounting & business subjects, to have a better chance of passing the exam. Only YAEGER has a good online classroom style of teaching, the same style i had back in college to learn accounting for the first time. It is so detailed and convenient it has a program that helps you to easily digest the lessons. The lessons are prepared in a format that will make you to easily grasp the concept of the subject unlike the other review courses that will make you feel overwhelmed of the materials, books and the kind of teaching that is so rigid/inflexible that will cause you getting bored or much confused. YAEGER is like your favorite professor in college, that you could just understand and relate to everything that is being thought. I think Yaeger can help any one pass the CPA exam. The road to passing the CPA exam is certainly not an easy one; however, you certainly can’t pass the exam without putting in the time. The first step is formulating a plan. That’s where I think yaeger can help. You can spend your time studying the important topics, which the instructors know from experience will be on the test. Follow the program, study and pass the exam. Since last year I’ve been looking for CPA Review School that doesn’t cost a lot and is in a classroom style, however, to attend it takes so much of your time and effort. I have been reviewing stephanie’s comments and I think that even if you are not actually in a class, Yaeger CPA Review makes you feel that you are. I am new here in the US and would like to be competitive and get a good job as a CPA. I know that taking the Yaeger CPA Review even if its only in DVD will help me to pass. I am really planning to take my review course as soon as possible. Friends that were just points away swear by yaeger. The teaching technique is true old school spoonfeeding. Why I believe Yaeger review will help me pass? Well ive been studying for this exam for a very long time and up until last month I have been extremely unsuccessful with passing. Ive used multiple multiple multiple CPA study review courses, ive spent more money on these review courses then I did on my engagement ring. Well atleast close to. But last month I added only the MCQ’s from yaeger and somehow passed by the skin on my teeth. I understand that in order to pass this exam you have to be extremely dedicated and strong willed, but all of that will not matter if you do not have a strong review course to work with. So if only using the MCQ’s along with other review courses has given me the slightest edge on this exam, there is no telling what the whole package will do. Good luck to everyone, wish you all the best! I would love to receive the giveaway for the Yeager exam because I have already tried Becker and did not pass! I have taken the classes and self-study. Even when I took the class with the instructor they just skimped through. They did not give real tips and why a question is tricky. I need the old school approach where someone can hold my hand giving me step-by-step. I used Becker so I have paid A LOT of money for the exams preps plus the actual exam. Yeager is affordable and hopefully I can cut down on the full affordable cost if I am picked to win the giveaway. I love that Yeager has the customer service line so that I can call even after hours. Yeager also have the unlimited viewing of the software. Using Becker you have the restricted time frame. I work as an auditor, I am a mother, and my husband is also in school. Knowing that I have to hurry up and review and learn by the expiration date was overwhelming. Before researching Yeager I researched Wiley, and after reading the reviews I believe that Yeager is the best of both worlds. Wiley will provide the in-depth information and Yeager’s lectures will give me the guided instruction that I feel like I missed from Becker. I really want to pass the exam and I know that I have to take a different approach and even a different exam review because Becker is obviously not cutting it for me! Please help me. I think this would be a good course for me since I really need to have an instructor showing me how to do the problems and explaining why any given concept is applied. I think that the video lectures and help on each step would be very beneficial for me. I am currently taking online classes and I find it very difficult to learn what I need without searching out a video source for lecture. You tube has been great for this, btw! I like the idea of having video lectures to watch along with a hotline to call with a specific question in order to get clarification from a live person. This could prove to be very helpful. I would like to win this giveaway so that I can push forward after I complete and receive my bachelor’s degree this fall and take the CPA exam and pass it on the first try. Yaeger CPA Review stands out above the rest with a teaching style focusing on the WHY behind every single concept. As an MBA graduate soon to also complete my Master of Science Accountancy, I feel nowhere near ready to sit for the CPA exam. Maximizing the benefit of study time is a priority to me, and Yaeger’s explanatory lectures will allow me to most effectively gain a comprehensive knowledge of the material. With an 88% pass rate, it’s the best fit with my goal to pass all four parts of the exam on my first attempt. Add to that the personal customer service readily accessible by phone, I feel I will gain the confidence I need in both the exam and my professional career. In my dissection of several CPA review courses, the main reason that I think the Yaeger CPA Review will help the most is being able to see someone work the problem. Being able to see how the instructor sets up the problem, then works through it will be very helpful. In my experience at work (as an accountant at a construction and engineering firm), when I need to figure out how to do something that I haven’t done before, I like to work through the issue including T accounts to fully understand the process. Yaeger seems to provide that type of detail. And with an 88% pass rate, how can you go wrong? I recently graduated with a B.S. in accounting and finance. I had always planned on taking the CPA however have gotten stuck in a corporate job to pay the bills. I believe that Yager would give me the push I need to freshen up on my accounting topics. This would help give me the drive to finish the CPA exam and fulfill my dream to get those 3 magic letters after my name, CPA. The teaching style and the customer service are 2 things that I know ring true to the style of how I learned account in the first place. I was always taking notes and asking questions after class. Thank you for the consideration in the Yager CPA give away and good luck to everyone! understanding if not a little enthusiasm as well. out to a Yaeger representative when it is convenient for me. other companies helps Yaeger gain a lot of brownie points in my eyes. candidates for a reasonable price. FUNCTIONALITY! This is the number one reason I believe the Yaeger CPA Review will help me pass the CPA exam. Being a student who learns best from visuals and having someone explain the material, I believe the conventional approach of explaining each step of a problem will help me “learn” the CPA material. Since receiving my B.S. in Finance from The Ohio State University in 2009, I decided to pursue the CPA so in 2011 I went back to school in order to meet the requirements to sit for the CPA exam. By doing this, I was exposed to a lot of material in a very short amount of time, so the step-by-step approach Yaeger offers coupled with in-depth explanations will surely help me learn the concepts of accounting. Furthermore, the Yaeger CPA review provides a convenient option that will allow me to study at home, and at the same time, still have the feel of a live class with the online lectures and hotline to ask questions. Having a full-time schedule, study time is often difficult to come by so this format is perfect, and with the hotline providing real time help with questions I might have is awesome! Last, with investing so much time and money into pursuing the CPA designation, I personally want a course that is going to fit my needs and provide me with the tools to pass the CPA exam, and I believe Yaeger CPA review provides just that! After 25 years in finance and experience in multiple positions with large and small firms, I am going back for my CPA. I have held analyst positions up to CFO positions. Historically, every time I heard the question, “Must your CFO be a CPA?,” I would emphatically say no. Now I am not so sure. Can Yaeger fill in the blanks to help a CFO become a CPA? I think yes, as I have always heard good things about this program. Hello, my name is Georgia and I believe that Yaeger CPA Review is the right one for me because it offers the traditional or “old-school” teaching style which is ideal for me as a visual/aural learner. Twenty years ago, I immigrated to this wonderful country in search of a brighter future. Today, I hold both an associate and a baccalaureate degree in accounting with one class remaining in the graduate (MSA) program. 1. Yaeger Uses Traditional Teaching Methods. Because my learning style is more conducive to the traditional classroom, I feel that Yaeger’s approach will break the material into meaningful chunks and help me decipher the information which otherwise seems overwhelming. 2. Yaeger Teaches Concept & Tactics. Accountants can only perform their jobs optimally if they have a true understanding of the concepts. A visual review and application of the core concepts should reinforce my knowledge of the materials presented in the exam. Yaeger’s approach to explain the tactical strategies necessary for success in the CPA exam separates it from other programs. 3. Yaeger have a vested interest in my success. Yaeger is a family-run business and as they say, “Your success is our success”. I believe that they are committed to offering the best quality product at the most affordable rate not simply to be profitable but to give each person a real chance at success based on years of experience. 4. Yeager Uses the Best Materials Available. Yaeger uses the renown Wiley products (books and software), the best on the market, as their teaching material. These materials coupled with their teaching style provide a winning combination for a successful CPA review. The reasons previously outlined are just some of the many ways I believe that the Yaeger CPA Review would benefit me in my quest to become a Certified Public Accountant. For me, winning the Yaeger contest would be delightful because it would allow me to begin studying right away. My goal is to achieve CPA designation with two years—before my 40th birthday. Thanks so very much for considering my submission. Win or lose, Yaeger will be my choice for CPA Review. Continue the great work! Your CPA exams make your stomach shrink and your hair stand on end the very moment you think of them – those are typical symptoms of CPA exams fever, but don’t fear as Yaeger is your solution. We all know that passing all four parts of CPA exams is not a piece of cake, but Yaeger Team will definitely help you get one! Believe it or not, but these features will make your CPA studying struggle easier and hopefully more enjoyable. Moreover, the instructors who present the accounting concepts are learner-oriented and professional. They indeed know how to put their ideas across. And I appreciate their sense of humor and friendliness. I am an old-school learning approach follower. Maybe this is because through all the years of my education I was used to taking notes and attending the lectures. I love it when everything is just explained in detail with relevant examples. Graphs, charts, tables presented in Yaeger handouts are particularly helpful for me as I am very fond of visuals. And Wiley textbooks plus testing software are part and parcel of the Yaeger lectures. Honestly, there couldn’t be a better match as the lectures help you understand the most difficult concepts and the Wiley books will be a great source of reference for every single part of the CPA exam. And just last but not least, with Yaeger you will go FAR, BECause it is the best CPA preparation course ever and you will remember all REGulations and AUDiting concepts forever! I graduated with a B.S.- not in accounting. Then, I went back to school specifically to get the credentials to sit for the CPA exam. Now that I have them, Becker is not cutting it. I chose Becker to get it done the first time… it would be worth the money. My entire savings went to Becker (yes, I paid the full price to get the payment plan), so I’m stuck with it. I need something else that can explain this to me and Yeager is the only one who can do it! I need a classroom setting, on my own time. Just watching the sample videos helped me on those topics! Thank you in advance for considering my application. There are a few things you need to pass the CPA exam. The timing in your life has to be right, you have to be committed, you have to believe you can pass and you need a review course that is right for you. It’s the right time, I am committed and I believe I can pass. Now all I need is a course that’s right for me. The last time I sat for the exam it was by pencil and paper. That makes me feel a little old and really rusty. I need a course that can help me to remember the old concepts and teach me the new ones. I need someone I can count on to help me with any questions I might have about the lecture material. The Yaeger review course provides a concept based lecture in an easy to understand format. This is going to be key for keeping a steady studying pace. I won’t have to waste hours researching additional reference material to answer questions. I’ll already have learned the concepts from the lectures and the Yaeger course will also help me to apply them. I want to learn the “Y”s. I also feel great comfort in knowing I’ll be able to reach out to the instructors for any further clarification on the lectures. The demonstrations of the lectures made me feel like I was back in college. I did well in college back in 2002. I have a strong feeling that I could do really well with the Yaeger review course. If given a Yaeger course I will not waste the opportunity, it is time for me to pass this exam! I believe I can pass, do you? I have been on your site and read the reviews of the CPA courses. I love the Yaeger CPA review because it teaches using the old school method which I personally like.. I do well and understand more when there is a professor writing on the board. After reading their review page I liked the fact that they use best materials available (like Wiley, Gleim) in the market so you get value for money. Also listened to the demo lecture by Cindy she sounds awesome! I was impressed at the ease with which she explains such complicated topics. So Yaeger has the best materials, awesome instructors, terrific passing rate, wonderful customer service and to top it all a decent price. I did try Becker back in 2007 but this is way better. Looking to pass the CPA exam in 2013!! I am a recent accounting graduate and new hire at a public accounting firm. Everyone I have spoke with has told me not to wait on the CPA exam, but rather to take it as soon as possible. Passing the CPA will allow me to excel in my field and have the greatest career potential. With an 88 percent first-time pass rate, I know Yaeger can allow me to achieve my potential. Yaeger’s success does not surprise me for two big reasons. First, they offer a variety of learning resources to ensure that I will understand the material. Some topics are best learned through books and example problems, while others are better understood through lectures and explanation. Yaeger will give me everything I need. Second, they use the teaching style a recent graduate like myself is most familiar with. They use classic classroom setting teaching. Technology does not replace talented teachers. With talented teaching at its core, Yaeger’s CPA Review is able to build on their great base with their other resources. After thorough research, Yaeger appears to be the best option for me. Thankfully, they are also almost half the price of Becker. I want to be confident that I will pass the CPA exam on my first attempt. I believe Yaeger CPA Review can give me that confidence. Lets face it. There is an increasing trend of CPA aspirants across the globe out of which many are already members of one or more professional bodies. Still, why CPA? You know the answer. That’s why you are now going through my post. So what can go wrong in CPA Exam preparation? Our Plans, methods of study, time we put in for understanding the contents and practice. I bought Wiley Review course( paperback)( the cheapest review course available) and started with BEC and pushed myself to read each word by word and prepare notes. After finishing first module in BEC, I understood this would not work as easy as I thought. Gosh! its full packed theory.. Who is going to remember this stuff after 2 days unless we keep on revising the notes. By the way, Don’t start with Auditing if we don’t have prior experience with the subject. Then I started looking for easier methods. God knows what all came in bits and pieces… At this point I got confused which were better, whether focus notes would cover all I needed, which are the areas required focus more than just focus notes bullets etc. Finally I got the answer I was looking for after spending hours researching. 2. In one shot, we get everything we are looking for. They know, from their many years’ experience, what candidates want and in which form. They are veterans. Just watch the demos. 3. Regarding Old school teaching style, imagine we are attending a Classroom crash course just weeks before the exam. We are still far ahead of completing the material. What would we try to do? We give ourselves 100% to the course and try to memorise the lectures and points discussed in the class. Just apply this method for CPA preparation a little early with Yaeger and see the result. Yes.. that’s what I was talking about. 4. The best part is that we can watch video lectures over and over again. 5. We should believe in what Yaeger has to offer and they have ‘helpdesk’ facility which we need to explore. Give it a shot! my fellow aspirants and see the outcome. The pass rate is as high as 88%. Imagine we are one among 88… It feels great, right? Oh Yeah… me too… Lets make an effort to increase the pass percentage to even higher. Kudos to their quality of lectures, notes and expert advise. I will update this post with my results. My best wishes to all CPA Aspirants. The CPA Exam……..a personal goal I have yet to accomplish. As time has passed after gradutation and my career has progressed I have missed the challenge, focus, and commitment required to expand my knowledge of accounting. After reading through the comments, and watching the lecture clips I have found myself truly enjoying the approach of this review course. At that momment I realize this review would be the one that will help me accomplish that personal goal that has escaped me. I sat for the exam straight out of college in 2003 but was not able to dedicate the time to prepare. While reviewing the benefits of the Yaeger CPA Review course I was impressed by a number of things. The first was the pass rate. I know it is not my first time taking the test, but with the amount of time that has passed since I finished college it might as well be. The second was the presentaiton itself. It was very easy to follow the clear and concise lecturer. I must say I was instantly back in school and ready to learn. The third was the versitility of the course life and things like it can find a way of jumping the line. It is important for me to be able to study whenever I find a few extra minutes. Last, but definately not least, would have to be the support and customer service. It is claming to know that the hotline is there if you need it. Don’t all of those reasons seem to bring that goal within reach? In this day and age where people are hooked on the internet, social media and handheld devices, I am one of those people who require: A good design on easy navigation to find information, good content, no annoying images, and consistency. This is what Yeager provides in his reviews! He is keeping up with the every changing world and yet still keeps the material simple to understand. For his reviews to stand the test of time will keep people coming back for more. Why is the Yaeger CPA review right for me? I’ve tried other courses and I’ve failed. I learned the hard way that I don’t study well or prepare well when I have a program telling me that on this day I should be this % complete. I am a bad test taker, and it takes me a couple times to read and understand the material. Watching the Yaeger sample videos, I get a feeling that I will be able to study better and grasp the knowledge for the test easier. Why else is it right for me? Well I’m 36 years old and been in the accounting field since 1998. I have done tax accounting almost the entire time, so any help I can get on the audit side will greatly benefit me. Don’t get me wrong, I have the audit time I need, but I don’t keep up with it enough, so the Yaeger CPA Review will greatly benefit me. As I said, I’m 36. I was young, arrogant, and stupid once. I didn’t listen to the words of my mentor at work, “Get your CPA early before you start a family or you’ll be almost 40 before you finally get it.” Wow was he right. See I tried a few times, and again the studying was rough for me. So I found a girl, got married, had twin boys (age 5) and moved my family back closer to home (Pittsburgh) from where we were (Washington DC). I bought a house and have a stay at home wife. I lost my job a year ago and I’m back to work but at 25% less pay than what I used to make, so things are tight. I had the money set aside to buy a class and focus on the test this year, but then I had too many family injuries (broken bones…did i mention twin boys) and a roof that is leaking. So my savings for the review had to go elsewhere. Family comes first. I really would appreciate and make the best out of this review course. I have set a goal with my kids. They start kindergarten, so they will have homework. Their daddy wants to start the Yaeger CPA Review and do his homework right beside them at night. And when they graduate at the end of the school year, I want to be wrapping up the last section of the exam and finally getting CPA behind the name. I know the opportunities for me are there once I finally get this goal completed. Thank you for the opportunity to apply for this giveaway. I know you will have many great and worthy applicants to choose from. The first time I got to touch Yaeger CPA was when I prepared my CPA ethics exam. I tried to see how to do the exam. Yaeger has provided detail but not awkward information on it. This really caught my attention. In my opinion, the CPA test takers are all adults who have the control of themselves. The expensive test fee of nearly 1,000 bucks also made sure that every test taker studies hard for the exam. However, there are still people who pass and not. Why? The answer is simple. People all read similar materials, but what matters is whether you understand the materials you have read. I think the most important figure is to let the test takers understand the material and utilize it. For example, the awkward codification of GAAP and IFRS gives many books a survival space. It doesn’t matter how “accurate” the material is, but how “understandable” the material is. I love one part of Yaeger CPA that it does not try to create its own text books while Wiley already has perfect preparation books. Yaeger CPA focuses on letting people fully understand the materials and apply the knowledge in the test. The process of familiarity is more important than how professional the material is. BTW, the Wiley review book is already the most professional one. All in all, the meaning of Yaeger CPA is to let you fully absorb the material necessary for the CPA exam. Tell yourself: I can pass the CPA exam! That’s why the name of this website exist. I believe that Yaeger CPA review can help me pass the CPA exam because it offers instructional videos as opposed to presentations. I am a tax attorney and I believe material is best learned through interaction as opposed to rouge memorization. I studied and passed the bar exam using the Barbri bar exam review program. Barbri’s program was very similar to Yaeger’s where students are offered pre-recorded lectures to review vast amounts of information. This format worked for me in the past and I believe it will work once again through Yaeger’s cpa exam review. I believe that Yaeger’s course outlines will be helpful in organizing the material. I am currently taking classes in a Master of Accountancy program which uses Wiley products. After reviewing all of the cpa review courses, Yaeger is most consistent with my current macc program because Yaeger also uses Wiley books. Lastly, I like the fact that students are welcomed to contact the instructors for assistance. I plan to use this feature to reinforce the concepts taught by the professors and tested on the exam. I do not have an accounting background, and I learn best through conversations. Therefore, the student-teacher interaction will be very helpful for me. Wow, what a giveaway! Thanks so much for giving us the opportunity. I’m a single Mom, raising two kids, full time job at a CPA firm. Studying for this exam has been one of the major obstacles I have encountered in my life! I want to show my daughter who will be off to college next year that hard work and studying pays off in the long run. This has been a life long goal and I plan to achieve it! Having a great study program would help me tremendously! I’ve looked at purchasing one, but not able to at this point, but winning this would sure point me in the right direction! The Yaeger Review seems to have it all! Not to mention an outstanding pass rate of 88%. I like the option of self study since I work full time. It’s like being in class, but able to stop and start as needed. I like the classroom style, where the instructors explain everything in detail. I have been out of school for 18 years, so some explanation is needed for some subjects. I also like the idea of dealing with a family business with great customer service. Thanks again for this wonderful opportunity! Hello. My name is Phillip James. I have a BA in Psychology, and a MBA with an emphasis in accounting and a career that is in a holding pattern because I do not have the CPA designation. My first attempt at the CPA exam was in 2009, with self study materials from Wiley and Gleim. I just missed passing the BEC exam by earning a 71, a very frustrating experience to say the least. So now in 2012, I am back on the road to CPA redemption. I feel very strongly that the Yeager CPA review course is the missing piece that will put me in the CPA winner’s circle by January 2014. Old School approach – In reviewing the online views, it was refreshing to watch the instructor bring the solution to life with the white board. I am old enough to remember having to go to the chalk board and work out the solution step by step, so seeing that brought back memories. I like to go through problem examples with a pencil and paper to get a deeper understanding of the concept so having the white board solutions was a welcome sight. Accounting is a skill and language that can only be learned through hearing, seeing, and doing. Concepts and Tactics – The best accounting instructor I ever had always demanded, “Read the English Scholar” when she used CPA review questions as part of our assignments. I really like seeing that an integral part of Yeager’s strategy is to equip their students with logic to answer questions instead of memorizing questions. E-learning – I am usually able to figure out most things when it comes to accounting problem solving. Occasionally, when I am unable to figure out something, I reach out to my CPA co-workers to varying degrees of success. It’s very comforting to know that Yeager’s availability and incredible customer service is available when I need it so that I no longer need to rely solely on coworkers or my own understanding. The “Y”- A fundamental understanding of the logic pattern behind the question is what separates 71’s from 75’s as I found out in 2009. The plan of crossing my fingers and hoping my weak areas are not included on the test will be eliminated with Yeager. In self studying, I really did not have the adequate resources or people to dig deeper when I did not understand and I am confident that is the reason I did not pass. In summary, I believe the Yeager CPA review will make me successful because the key features are continuations of learning styles and concepts that I am already comfortable with and the added benefit of live knowledgeable staff to answer my questions. Winning this contest will allow me to have a happy 35th birth year like Yeager and an ecstatic 36th upon passing the exam. I’ve used Roger CPA Review on all my other sections of the CPA exam and I’m just not jiving with him on FAR. I need more conceptual info on the topic. I noticed Yaeger has over 51 hours and a lot of walk through multiple choice questions… Rog, although I love his style, only has 33 FAR lecture hours and I’m just lost with everything I watch. I need either more video time or some 1-on-1 phone time with a live person to guide me through! It’s impossible to state which CPA review course is the best for every aspiring CPA because of its various price tags and learning styles. Finding the right balance between your family and job can be difficult. Choosing the CPA review course that fits your schedule and learning preference is even more difficult. Yaeger CPA Review is the clear choice for those who prefer the “personalized” classroom learning between the instructor and only you. Each concept is explained through lecture and then reinforces your understanding by working the multiple choice questions and simulations with you. This method of teaching and Yaeger CPA Review is also favorably reviewed and endorsed by Stephanie Ng, a renowned professional in the CPA arena. Yaeger price tag of $1,787.00 for the Home Study Complete Course includes 136-hour teaching video lectures, instructor-authored handout, set of four 2012 Wiley CPA Review textbooks, Wiley Test Bank Software, access to Yaeger CPA Review Instructor Hotline, and unlimited use of the course. This price is 46% discount to a competitive, CPA review course that starts with the letter B for their four-part bundle. It is undoubtedly one of the best values for money among the many CPA review courses available. Not forgetting the overall 88% pass rate for Yaeger first-time students as against the overall CPA exam pass rate of 49%. Nine years have passed since I last attended college, and I still think classroom learning is the best form of teaching. This is because you could focus on the task at hand and eliminate distraction; you could evaluate and understand as you listen, and make notes for the important points; and ask clarifying questions. As a working mother aspiring to be a CPA, and with a four-year old toddler; my schedule will not permit me to stay focus on CPA exam preparation for 2 hours at a stretch on any one day. I have to break up my studying time in blocks of 15 minutes or less. Just scheduling this kind of “absurdity” is mind boggling, let alone being able to concentrate. Yaeger CPA Review was started in 1977 by Dr. Phil Yaeger, CPA; a family-run, face-front business, where your success is closely linked to their business success. The fact that they have been in their 35th year speaks volume on the integrity of their product. The teaching philosophy is WHAT to do, and HOW to do it, but also, WHY to do it. Teaching WHY you are doing what you are doing to get the right answer. Yaeger CPA Review emphasis is on understanding the concepts behind the answers. Yaeger high pass rate is a force to be reckoned with. Three unique features of Yaeger CPA Review are: 1) the classroom learning style where the instructor goes through the concepts, multiple choice questions, and step-by-step workings on the simulations; 2) the use of renowned industry-leading Wiley’s CPA Exam Review books and software as teaching material; and 3) the direct access to any of the instructors, namely Cindy Simpson, Phil Yaeger – the founder himself, and Gary to answer your questions. An associate of mine, who has signed up the Yaeger CPA Review, also confirmed with me that the “student hotline” is true to their promise. It is usually Dr. Phil Yaeger on the other end answering my associate’s questions. Yaeger personal commitment to every student’s success is unique in the industry. Additionally, Yaeger motivating instructors are knowledgeable and able to “cut to the chase” for you, so you will not waste much time on less important topics not tested in the exam. The emotional preparation for the CPA exam is akin to the athletes and coaches preparing for the Olympic Games. The “magnitude” of the CPA exam is hard to prepare for because of its attractiveness in aiding your career prospect in terms of higher salary, promotion and opportunity in other related jobs. The CPA experience is craved by many and experienced by a handful. You must be able to walk away knowing that you have given your best shot and rejoiced in the opportunity to test yourself in one of the most prestigious examination environments in the accounting arena. The above-mentioned features of Yaeger CPA Review could provide the emotional preparation, practice, and management to ensure that you can come closer to the CPA situational potential. It is undoubtedly a good CPA tool dictating enough quality exam preparation for confidence and concentration to pass the exam. Worst program ever. When they say it’s up to date, they mean as of recording date which can be a year ago. They don’t continuously up date. Just was doing Sub S module. They didn’t bother with the proper Sub S tax form, they show you a partnership form. How lazy can you be. i knew they had an 18 month time limit (most reviews have done away with that), I didn’t know there was a no refund policy till two weeks in i told Sonny there are too many problems with this program to have confidence it will assist my knowledge to pass.. They don’t really put that anywhere you can see it if it is posted. I can even live with that. But it’s the worst program I’ve ever purchased. I have a rule, don’t buy all 4 sections no matter how good the price. i broke that rule and I regret it. The test bank is terrible. I’ve gone through the Reg program and have complained to them on numerous occasions. it is not up to date. The questions that sync to the classes many times are not the question the instructor is talking about. Sometimes you can find the question if you can hit the “previous” or “next” button. Lots of times they are missing those buttons. They are even missing the “submit button sometimes. Sometimes you’ll get a question (too many times) that ask you to choose between options and they don’t have options. In reg they pretty much read the book to you. I can read. I need shortcuts, ways to remember the material and to see them actually work and explain questions. The test bank is lousy. There is no way to get automatic feed back, even homework questions have no automatic feedback… And lastly the big sell “adaptapass” doesn’t work well. Save your money. Concept is great but doesn’t deliver. I’m going to supplement with a Wiley testbank and see if that helps. Otherwise, eat the loss and try another review course. Man I thought it was just me that had awful customer service. I was about to purchase the material but decided not to due to false advertising on their website. Sonny is awful, and seems he’s the only one is customer service. He would not offer and codes even thought it says on their website. And when I asked about 2017 updates, sounded like he was making excuses and didn’t give me solid answer, said is not the material that’s changing but the way the exam is being tested. They retracted a few days later, but the fact that they issued this kind of announcement is suspicious… there are lots of good review course providers out there. We aren’t out of choices. This program would be so much better if Phil Yaegar didn’t do any videos what so ever. His constant expression “alright” and off camera looks are extremely annoying. Not to mention, he absolutely cannot teach. I get much better results after Larry’s lectures. Regret purchasing this program but it’s too late now.